Do you have one hour? 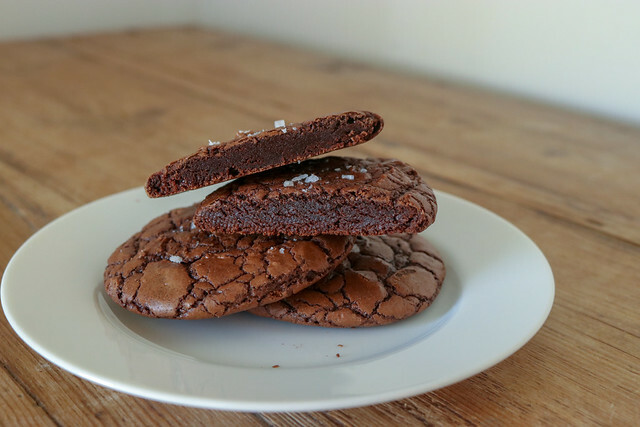 Then you have time to make these cookies! Really, they are super easy and fast. I can wake up super duper early and make them before work (and I leave home at 6 am). Sometimes, I don't have time to let them cool so I just lug the half-sheet pan into work. My co-workers don't mind. And I'm sure your friends won't mind too. This recipe is from The Boy Who Bakes. I love Edd Kimber, cookbook author and winner of the BBC2's Great British Bake Off. He has engaging videos and fun content on Instagram. 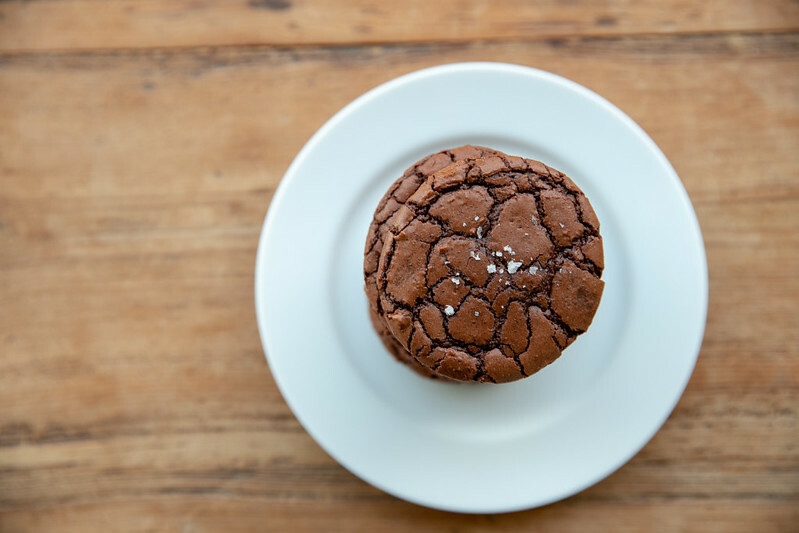 Earlier this year, he brought us heaven...in the form of a brownie cookie. 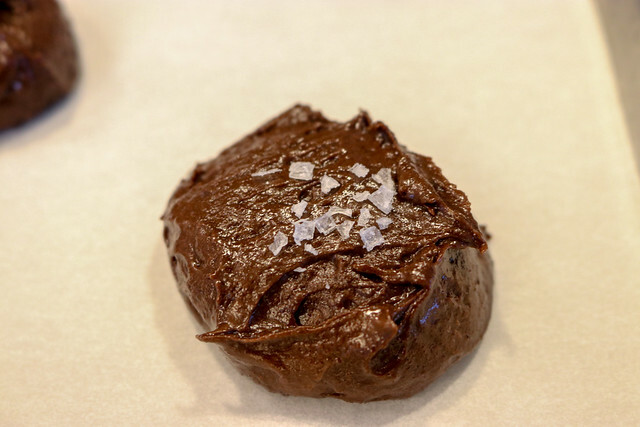 Baking these cookies is so much easier than baking brownies - you don't have to wait until the brownies are cool, cut them into squares, and place into cupcake liners. This is a brownie. In the shape of a drop cookie. 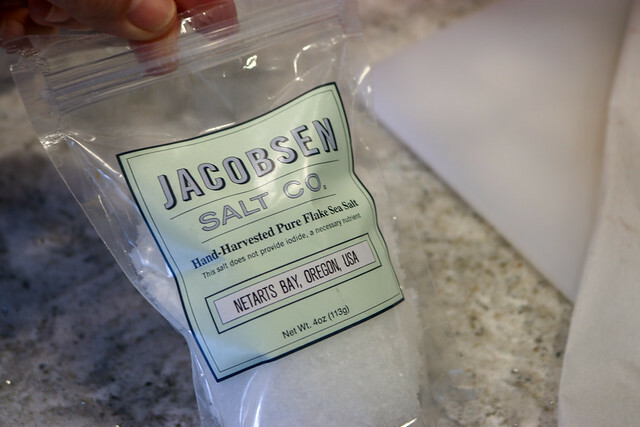 Oh, did I mention there is sea salt? Yes there is. The other thing that's key in this recipe is timing. You should mise en place your ingredients, preheat your oven, and have two parchment lined trays at the ready. A few colleagues have said these are their favorite cookies and I should bring them to every meeting. 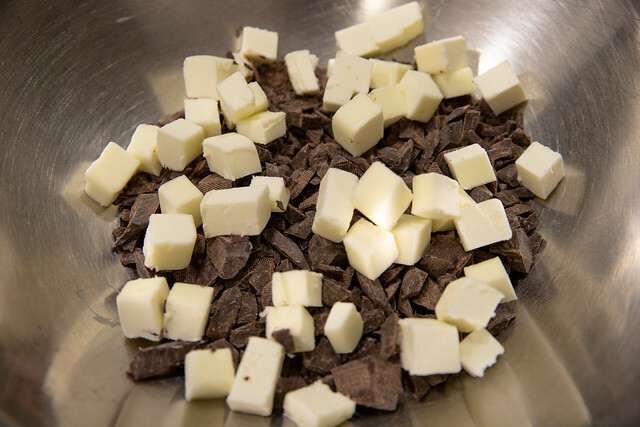 Process photos: Melt chopped chocolate and butter over double boiler. 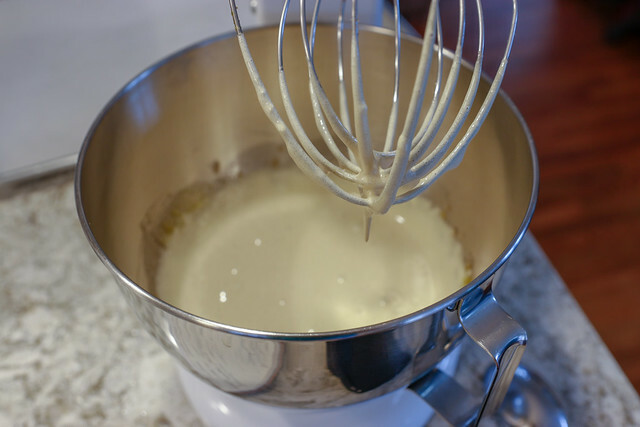 When the chocolate is melted, start the stand mixer containing the sugars and eggs. Beat for exactly 5 minutes. The final batter is thick and easily scooped into mounds. Top with flaked sea salt. As the Boy Who Bakes stressed, timing is important. Be sure to have a preheated oven at 350 F ready to go, parchment lined sheet trays (I use 2 half-sheets), as well as all your ingredients scaled and ready. 2a. Sift together dry ingredients (flour, cocoa, baking powder, and salt). Set aside. 2b. Using a double boiler, melt butter and chocolate, stirring occasionally. Remove from heat when melted. 3. 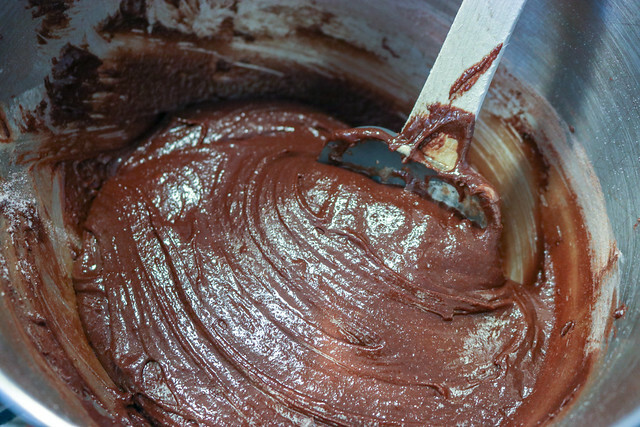 As soon as the chocolate is melted, beat together the sugars (granulated and brown sugar) and eggs in a stand mixer with whisk attachment for 5 minutes (set a timer...you want 5 minutes). 4. Scrape down sides of mixture and add the melted chocolate & butter mixture. Beat for 30 seconds to 1 minute until combined. 5. 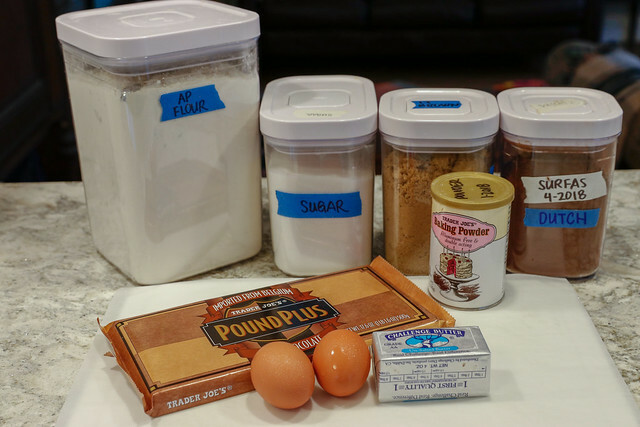 Add the sifted dry ingredients all at once and mix just until combined. I usually stop early and finish folding with a spatula until blended. But hurry...you gotta get this into the oven. 6. Scoop with disher (cookie or ice cream scoop) so they are uniform in size. (Note: Boy Who Bakes makes them really big. He fits 6 on a tray and I get at least 12.) They do spread so don't crowd them on the tray. 7. 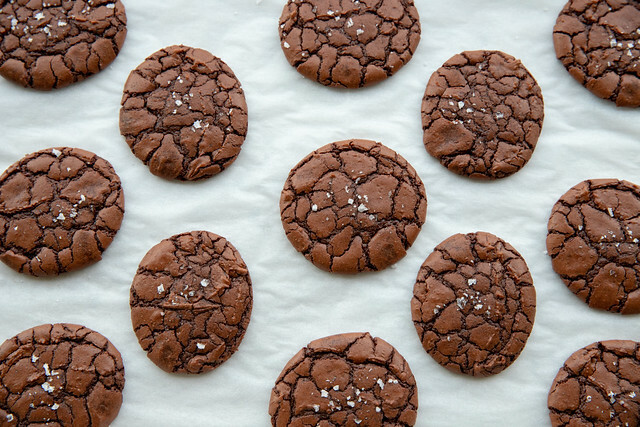 Sprinkle some flaked sea salt on top of each cookie. (When I started I didn't put enough salt on each cookie, so don't be afraid). 8. Place in center of oven and bake for 12 minutes. They will develop a crinkled top and puff a bit. I bake with the tray in the center rack and only bake one tray at a time. 9. Remove from oven and let rest on the tray until they are cool. Because they are soft, don't move onto a cooling rack until they are cool.